The Ktistai form the dacian priesthood. They are invaluable but small cavalry cores of elite warriors. Needless to say, they are experts in wielding the bow and spear, and can have a decisive impact on the battlefield. These men, the Ktistai, or “the ones set apart” are members of the most prestigious Getic priesthood. Apart from fulfilling many important roles in Getic society, some of the ktistai (all drawn from the Tarabostes nobility) also form small cavalry forces of elite warriors. Thanks to wealth and military education, they are elite warriors who know how to use the bow and the falx, the two most important weapons in Getic society. Their armor is also of high quality: the Ktistai ride to battle armored with mail shirts, greaves covered with baggy trousers and animal fur worn on the back. 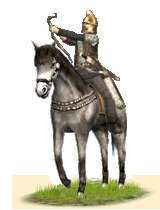 They are good marksmen and should be used in that role when possible, but if a cavalry charge is necessary the Ktistai can perform that role well too. The Ktistai will never break, disobey or act without orders, and more than other warriors, truly believe their souls immortal. They can only be recruited in places with a highly developed religious infrastructure. Historically, the Ktistai were the highest tier of the Getic priests, drawn from the most promising of the Getic nobility. They had the reputation of being able to give immortality to the ones of their choosing. The Ktistai were organized in similar fashion to the Celtic druids, performing almost the same tasks of seers, historians, judges, as well as being renowned doctors, astronomers and astrologers. It is thought that they, or at least some sects of them, were harsh ascetics, forgoing meats and sexual relations in order to purify themselves for service to the gods.